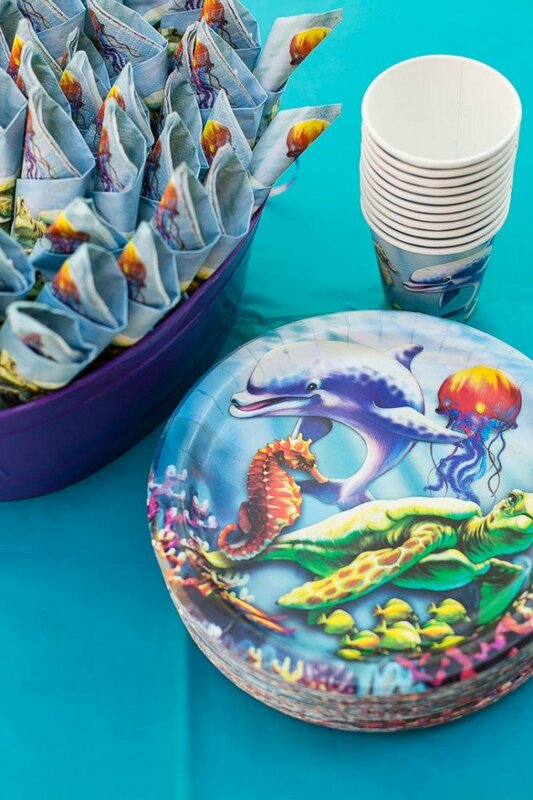 A complete guide on how to throw a mermaid birthday party with an under the sea theme, including ideas for food, activities and party favors. My big girls are 4! How did that happen? It feels like they just got here. For their party this year we decided to go with a mermaid (Under the Sea) theme. 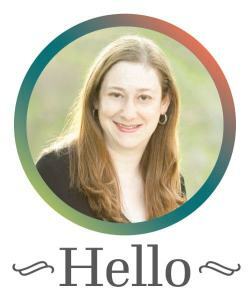 I had been pinning ideas for months, everything from food to decorations to party favors. The party was amazing, all of the kids had a great time and most importantly, my birthday girls were so happy! Here are all the details of our mermaid birthday party. Scroll down to the bottom to see the equipment and products you’ll need to recreate this party! First up, the food. Because this is a food blog, right? I went with a simple menu that I knew would please most palates – cheese and pepperoni pizza, caesar salad, chinese chicken salad, fruit, a vegetable platter and some table snacks. I made two types of snacks for the tables, something sweet and something salty. The salty snack was the classic chex mix recipe made to fit the party theme – I used whale shaped cheddar crackers, pretzel fish crackers and oyster crackers along with the chex cereal. 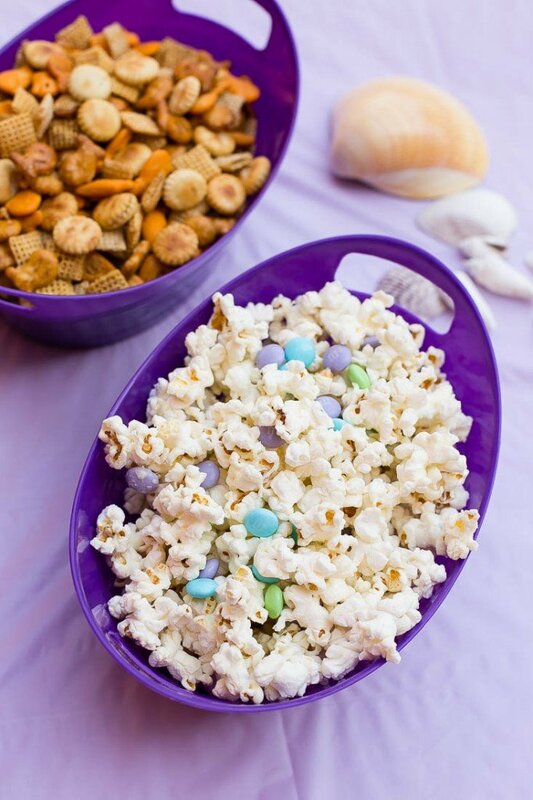 The sweet snack was mermaid munch, a simple mix of popcorn, white chocolate and M&Ms. This stuff is really addicting! 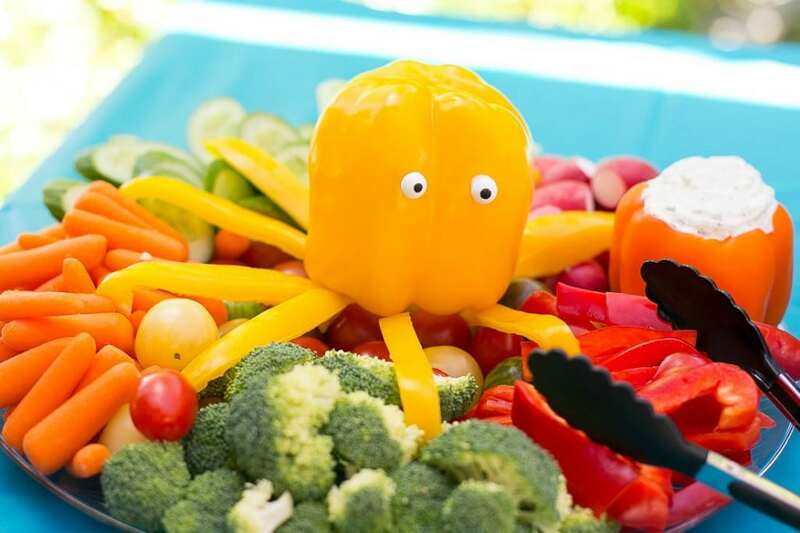 The vegetable tray also fit the theme – it was a mixture of fresh veggies served with my homemade ranch dip and topped with an edible octopus! The octopus is made from two bell peppers. I glued on the candy eyes with a few dabs of royal icing that I had left over from the cookies I made for dessert. No royal icing? Try attaching blueberries, olive slices or raisins for eyes with a toothpick. 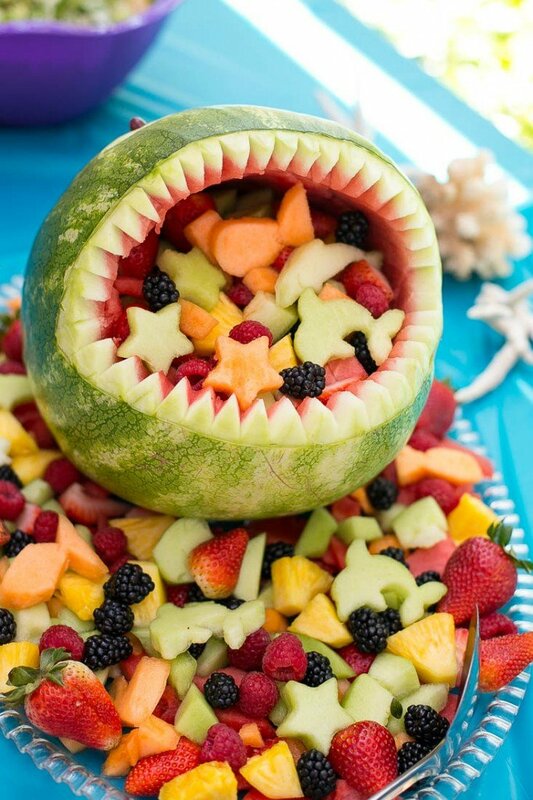 The fruit platter was the star of the show – a watermelon carved to look like a shark, filled with a variety of fruit including melon cut to look like fish and sea stars. 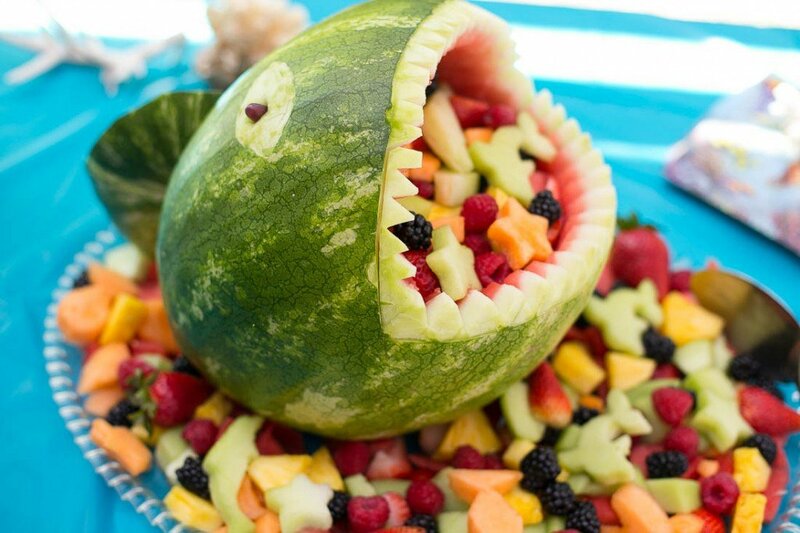 I heard more chatter about the watermelon shark than any other aspect of the party! And I can’t take any credit for it – my mom was the watermelon carving master. She followed this online tutorial. The melon shapes were made with small cookie cutters. Thanks mom, you are amazing! Next up are the sweet treats. I always do cupcakes for parties for two reasons: (1) I never want to stand around and cut 50 slices of cake and (2) I feel like I have a better grasp on cupcake decorating versus trying to decorate a big cake. I have a vanilla cupcake and frosting recipe I use every year. 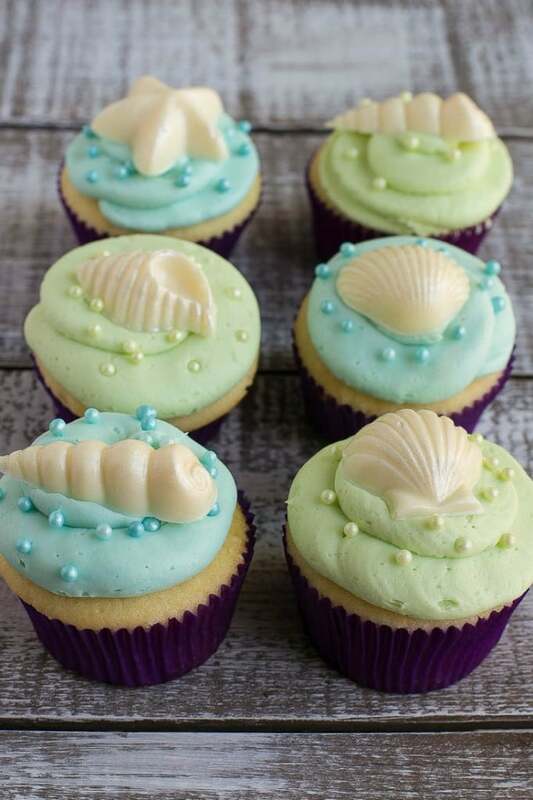 This year I made the cupcakes fit the theme by using edible candy pearls to match the frosting and I made my own seashell chocolates by melting candy melts and pouring them into molds that had been coated in edible white luster dust. Spend an extra dollar and get the greaseproof cupcake liners like I did, the color stays vibrant that way. I think it’s fun to do more than one dessert – I mean, what’s a birthday party without a ton of sweets? 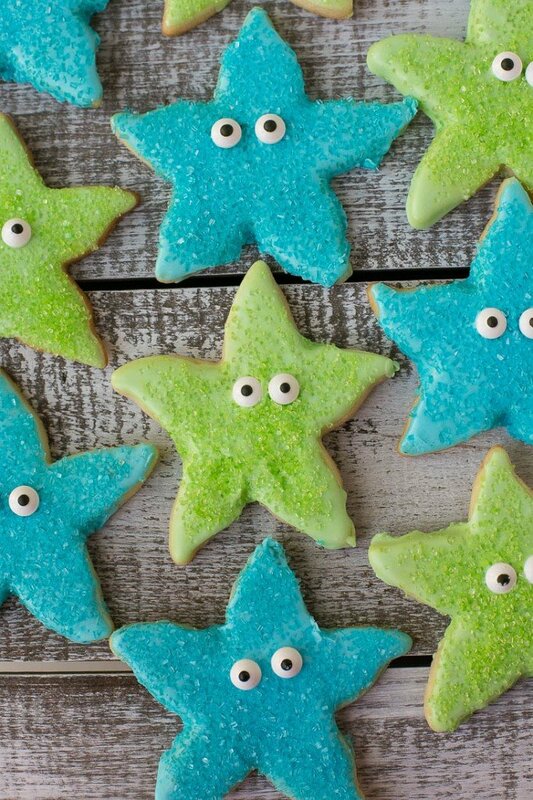 So we also had sugar cookies shaped like starfish that were dipped in royal icing, sprinkled with sparkling sugar and topped with candy eyes. Aren’t they cute? I use gel food colors, you get intense color without watering down your frosting. I use the sugar cookie and royal icing recipes from Sweetopia. Last but not least are the gelatin cups. I saw these on Pinterest, and they looked so simple yet so fun. 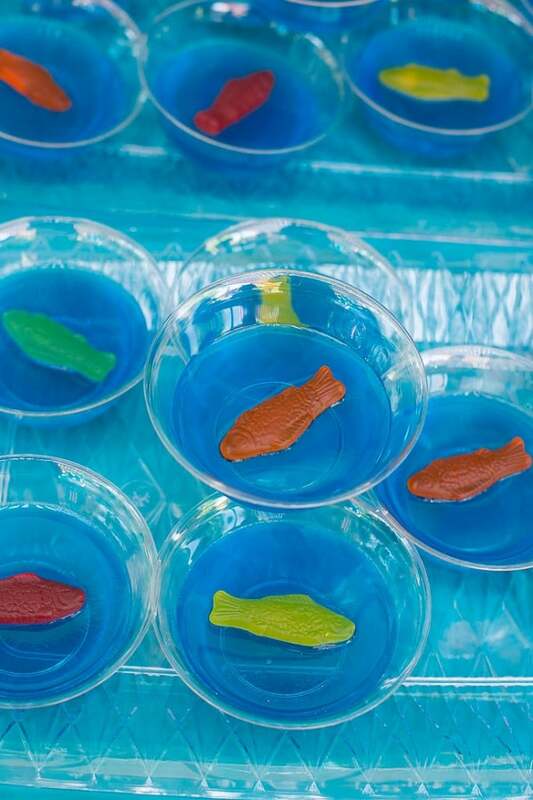 Cups of blue jello topped with swedish fish candies. These were the hit of the dessert table, they were gone in about 5 minutes! I found the little clear cups at the dollar store. Don’t add the fish candies until right before you’re ready to serve, otherwise they’ll melt into the jello. As you may have noticed, our color scheme was blue, green and purple. 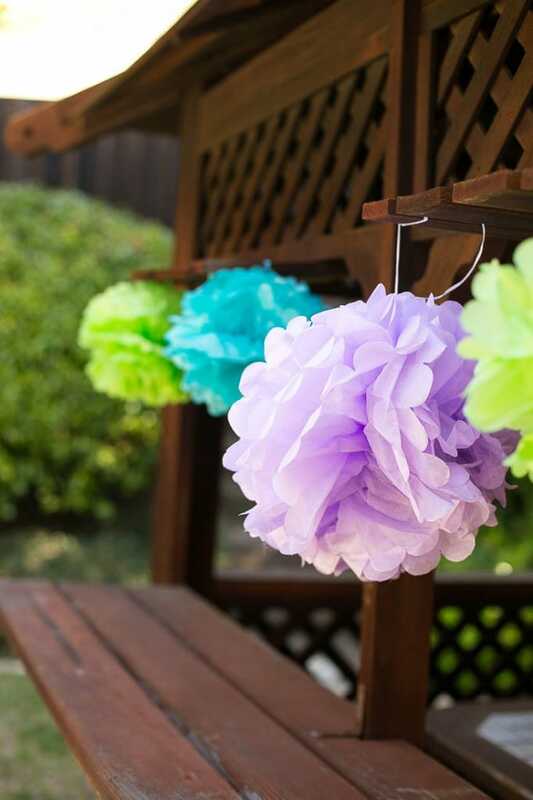 I bought dozens of paper pom poms in these colors and we hung them all over our yard. All of the paper goods and serving bowls came from the dollar store. Can’t beat the price! For table centerpieces we did live goldfish in glass bowls from the dollar store surrounded by sea shells. These goldfish were only in the bowls for the duration of the party. After the party, some of the fish were transferred to an appropriately sized aquarium with a filtration system and the rest of the fish were taken to a friend’s koi and goldfish pond. 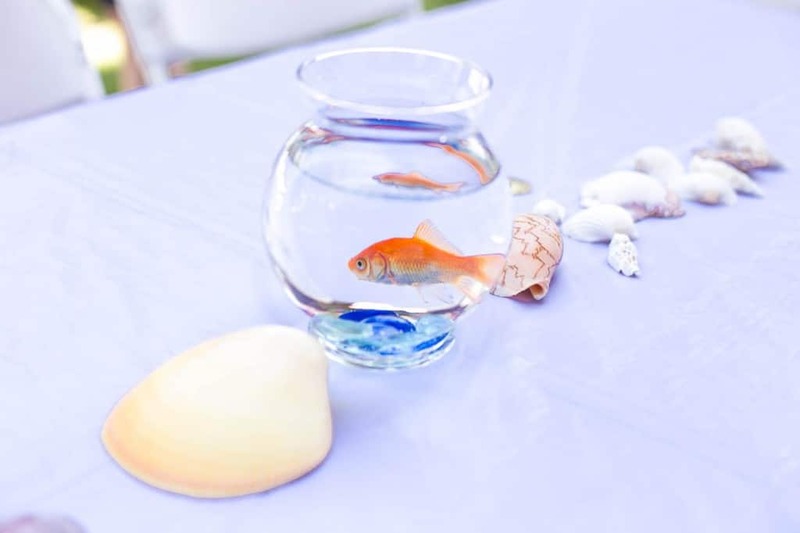 Do NOT attempt to use goldfish for centerpieces unless you have a plan in place for the fish when your party is over. Goldfish are not meant to live in small bowls, they are messy fish that can grow to be quite large and need to be in a designated aquarium! For entertainment, we rented an ocean themed bounce house. We also had a craft table where the kids could create their own aquarium scenes with foam boards and stickers. 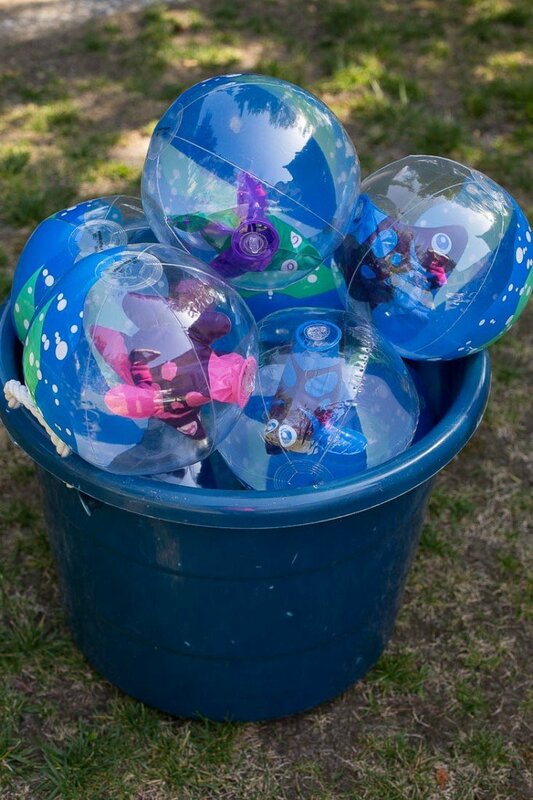 We had a bubble machine going and a bucket of these super cute beach balls with inflatable fish inside of them for kids to toss around and take home. The surprise hit of the party was the sand pit. 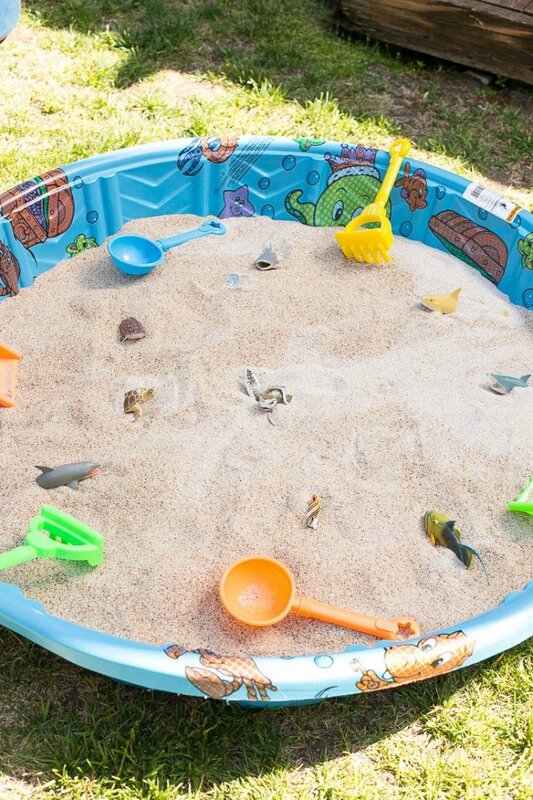 I took a small wading pool and filled it with play sand (available at home improvement stores for less than $5). I added some sand tools and plastic sea creatures on top and hid beaded necklaces and plastic coins in the sand. The kids LOVED digging for treasure, the sand pit was as popular as the bounce house! 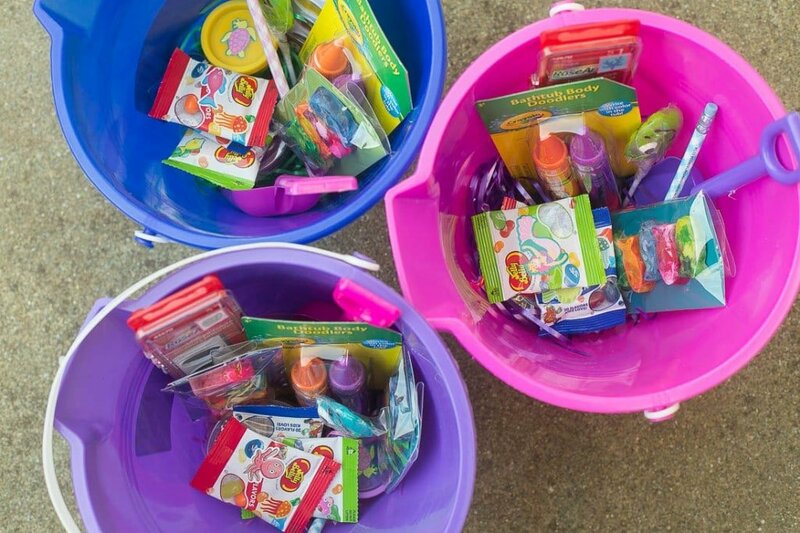 Last but not least are the treat buckets. I got plastic bucket and pail sets from the dollar store and filled them with watercolor paints, bath crayons, play doh, mini bags of jelly beans, fish lollipops, small containers of kinetic sand and homemade fish crayons. Many of the items were purchased on clearance after the holidays – some were stocking stuffers marked down to 70% off in January and others were Easter basket items on sale and none of the items had any holiday themed packaging on them! You don’t have to spend a ton of money to have a great party, you just have to come up with creative solutions. 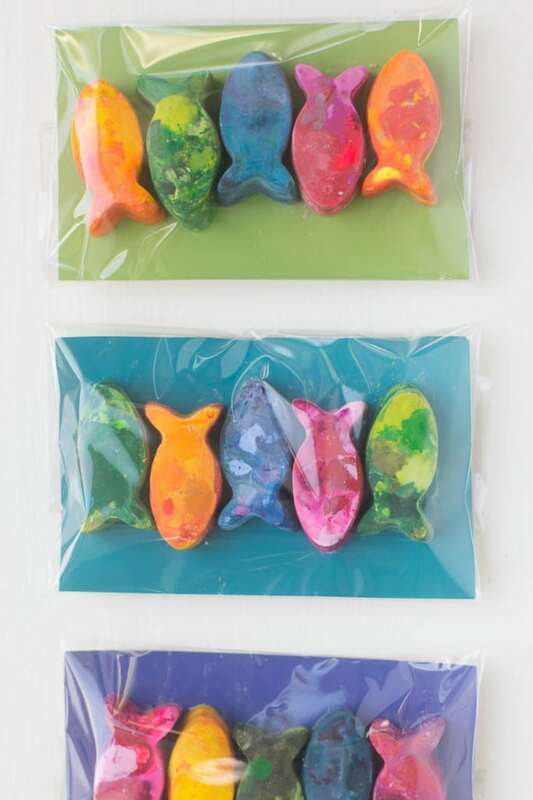 To make the fish crayons, I put peeled chopped crayons into a silicon fish shaped ice cube mold I found at the dollar store. I used the directions listed here. You can do this with any shape mold! I put the crayons into little clear bags with a colored backing. The colored backings are actually single color paint chips from the hardware store! I had a great time putting this Under the Sea birthday party together. I didn’t do it alone though – I had help from my amazing mom and wonderful aunt! I’m pretty sure that this was our best party yet – now how am I going to top it next year?! These girls are such a blessing that I can’t help but go a little overboard when it comes to their party – they deserve a grand celebration. Would you believe there were 5 sets of twins at our party? It must be a record or something. The girls’ tops are from Kohl’s and their tutu leggings are from the Disney collection by Jumping Beans at Kohl’s, sadly they’re no longer available online. Thanks for sharing! Where did you get the small cookie cutters for the fruit platter? They were actually from a play-doh set! 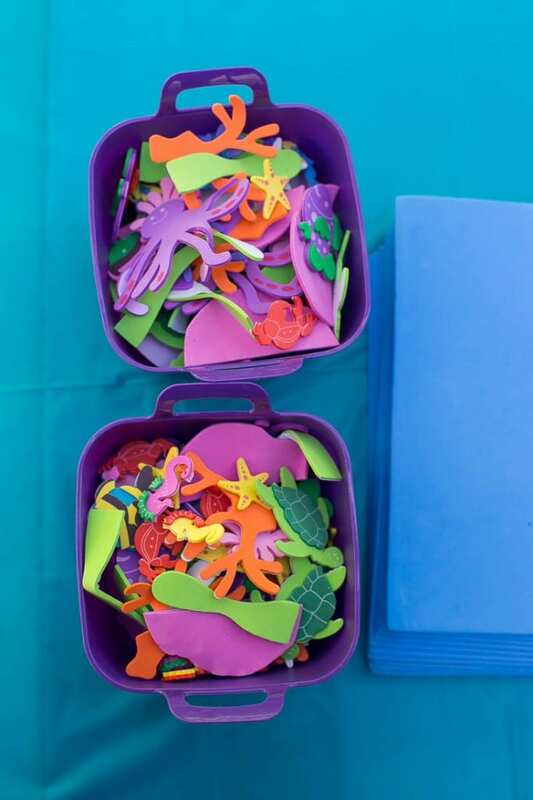 I was going to use just a small star shaped cookie cutter to do starfish, and then my kids were doing play-doh one day and I spied the little sea life cutters in the box, so unfortunately I don’t have a specific link for you. I often have luck finding small cookie cutters at places like Williams Sonoma and Sur La Table, Amazon might have them too. 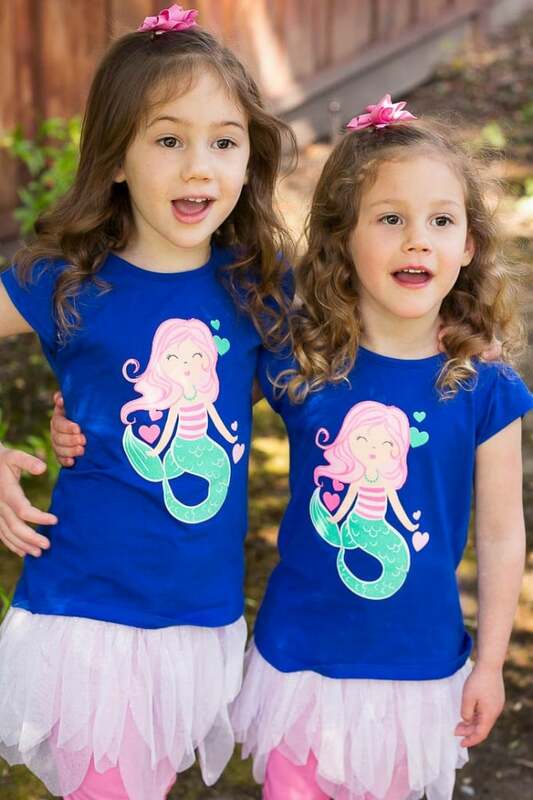 OMG…I also have twin girls that will be four in August and we are also be doing Little Mermaid party!!! Love the party theme and deco. I am looking into also doing an ocean themed party for my son. I was wondering how many bags of sand you bought to fill the plastic tub? I think the bags of sand are about $5 a piece at Home Depot. Which if I only needed a couple, that isn’t too bad. But we are having the party out of state and probably will not be bring back the sand with us. Which means we will dump it or give it away. Just don’t want to spend $50-60 when we won’t use it again. Hi Brooke! We used a small wading pool, the kind that fits 2-3 kids. It was plenty big because the kids didn’t actually sit in there, they sat around the edges. We used 4 bags of sand (50 lbs each). You might be able to get away with 3 depending on the size of your pool. You could always buy 4 and return the last one if you manage with just 3, Home Depot is really good about returns. Hope that helps! What a fun party! Love the fruit shark 🙂 Happy Birthday to your beautiful girls! I love it!! It’s brilliant and such a great idea. I don’t mind doing this creative idea in the future when I have my own children, haha. It sounded like you had a great party!